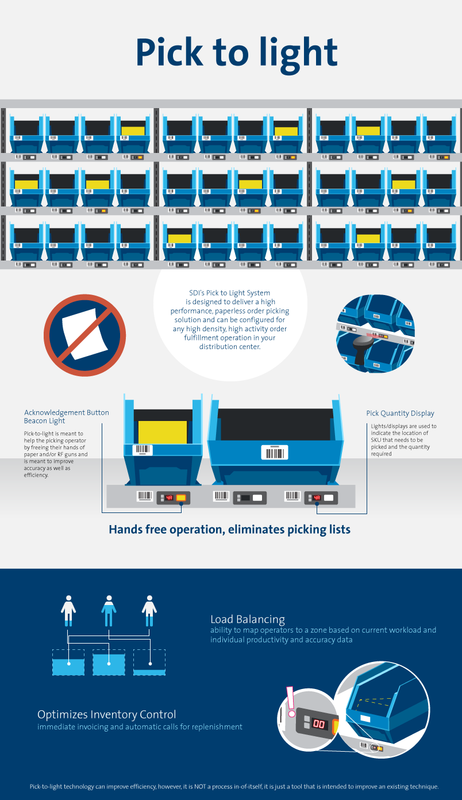 SDI’s Pick to Light System is designed to deliver a high performance, paperless order picking solution and can be configured for any high density, high activity order fulfillment operation in your distribution center. PTL virtually eliminates picking errors, maximizes picking productivity, and substantially extends inventory control. The Pick to Light system is simple; each pick location on a flow rack, shelving unit, or alternative storage/pick structure is mounted with a Light Display Module comprised of a digital display, to indicate the number of units to be picked, and push buttons for pick confirmations and exception handling.When an order is inducted into the system, the corresponding Light Display Modules illuminate with the required quantity, directing the order picker’s attention to locations where picks are required. As each item is picked, it can be confirmed as complete or marked as incomplete notifying the host server of a stock out condition. The order is automatically updated with what has been picked fully and what must be backordered. The instant feedback from Pick to Light can drive real-time inventory systems and this information can be used to automatically drive stock replenishment to the picking area as minimum stock levels are reached. Once a person is trained to use the system, usually in less than half an hour, individual picking productivity and accuracy is improved substantially over that found in traditional paper based operations.